Oklahoma is a southwestern state that lies within a continental climate zone, which means hot, dry summers and cold, dry winters. If you live in Oklahoma, select fruit tree varieties according to intended use, mature size, fruit type and bloom color. Many different kinds of fruit trees perform well in Oklahoma landscapes. 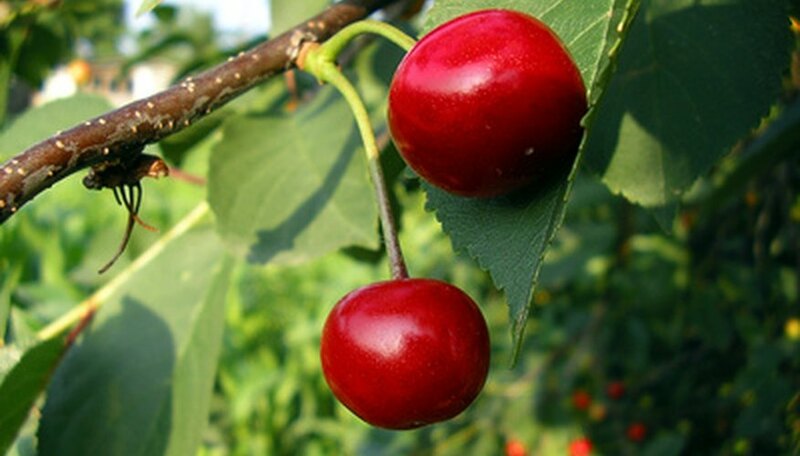 Black cherry trees (Prunus serotina) belong to the rose plant family (Rosaceae) and reach between 50 and 60 feet in height. This fruit tree features glossy, green leaves that turn yellow in autumn. The foliage, when crushed or bruised, smells like cherries. White flowers bloom from March through June, followed by cherries that emerge deep red but ripen to black. The fruit typically matures from August through October, and works well in pies, juices and jellies. This tree needs well-drained soils in full sun to full shade. Oklahoma gardeners often plant the black cherry tree along fences, roads and open woods. The Mexican plum tree (Prunus mexicana), sometimes called the bigtree plum, ranges from 15 to 35 feet in height. This plum tree variety blooms fragrant, white to pale pink blossoms from February through April. These blossoms give way to edible, purple plums that mature from July through September. This Rosaceae plant family member also features bluish-gray bark and green leaves. This fruit tree tolerates various soil conditions, but likes partial to full sun locations. Oklahoma gardeners often use the Mexican plum as an accent tree in prairies and thin woodlands. The red mulberry tree (Morus rubra), also called the moral tree, belongs to the Moraceae plant family and features hairy, green leaves that turn vibrant golden shades in autumn. White to green blossoms appear from March through June, followed by red, purple or black berries. These edible mulberries can be eaten freshly-picked or used to make jams, juice, jellies, wines and pies. Birds and wildlife also feed on the fruit. This fruiting tree tolerates various soil, moisture and lighting conditions, growing well in full shade to full sun. Oklahoma gardeners often plant the red mulberry tree along stream banks, ravines, riverbanks and ditches. The gum bumelia tree (Sideroxylon lanuginosum) goes by many other names, including the gum bully tree, the woollybucket bumelia and the gum elastic tree. This sapodilla plant family member (Sapotaceae) bears spiny branches and clusters of leaves with glossy, deep green tops and light, woolly undersides. Mature gum bumelia trees reach about 48 feet in height. Clusters of fragrant, white flowers bloom in June and July, giving way to edible, dark blue or black berries that mature in autumn. This fruit tree variety likes dry soils in partial shade to full sun positions. Oklahoma gardeners primarily plant the gum bumelia tree along property boundaries or in native plant gardens.